Here are ten things that I wish I knew before we started out. 1. Petrol will be your biggest expense in Europe, Turkey has the most expensive in the world. 2. European toll roads cost a lot of money but avoiding them will probably cost you more in petrol. 3. You don’t need a 4×4, in fact if I was to do this again I’d buy a van and convert it to a camper. 4. A winch is a waste of money, a good tow rope is all you need. 5. Always get a price before any work is carried out on your car! 6. Roof tents attract a lot of attention, sometimes unwanted. 7. No matter how well you prepare your car you need at least £2000 put aside for repairs. 8. Shipping will cause you the most headaches, no one will answer your emails, always ring. 9. Get business cards printed up before you leave- very, very useful. 10. India is a nightmare to ship a car into! – The toll system requires you to have a card, pick one up at the first toll booth you come to. – You don’t need a carnet, they will write your car details into your passport. – Fuel is very expense. – Away from the coast campsites are few and far between. – Some roads you will drive on are truly awful, as there are lots of road works going on. – Make sure you have green card insurance, you can buy this and a visa at the border. – Derya (gayeotomotiv@gayeotomotiv.com) speaks perfect English and can ship defender parts all over Turkey cheaply. They also stock Britpart parts. – The border crossing from Turkey is a nightmare -see my diary entry. I would advise you to use another crossing or turn up very early in the morning to avoid the ‘mafia’. – You do need at least one 100ltr fuel card for emergency use. Most of the truck drivers will lend you theirs but not all. – Fill up as often as possible as there are very few fuel stations selling diesel. – Always follow the trucks- some motorways don’t let trucks on them so there can be 100s of miles between fuel stops. – Police speed traps are everywhere, and different lanes on the motorway have different speed limits, so be careful. – The ferry crossing to Dubai for two people will cost you at least $1000 in total. – Wild camping is a no for me after we met some Germans who camped and were arrested for four days for spying! – http://www.a2b-garage.com know everything about Land Rovers and every other 4×4, the only place to go. – For shipping I found Prem (jalisales@glweststardubai.com) at GL West Star very helpful. – Some of the roads in Dubai are toll and you need a card reader in your car. We didn’t have one and drove on a few of these roads but nothing was said. – $1 (yes that’s his name) (assir522@yahoo.com) is the only man to use for clearing your car, he might even put you up for a night or two. – Black Hawk garage in KL are experts in Land Rovers. – It’s hot, AC is a must! – Food and hotels are very cheap, no real need to camp, plus it might be too humid to camp. – There are no proper campsites in Malaysia. – Not all petrol stations sell diesel. – The petrol stations on the run up to the Thai border sell car insurance for Thailand. – Crossing the border from Malaysia can be a bit hectic; you have a couple of forms to fill in which takes a while due to the tourist buses and long queues. Make sure you have insurance before you reach the border, as it is cheaper to buy it on the Malaysian side. – Get a tourist visa before the border, this will give you 3 months instead of just one if a visa is picked up at the border. – No carnet required but you do have to get a temporary import license at the border. Normally they will only give you a month but you can get this extended once in Bangkok at the main Customs Building- you can google the address. It was a bit of a nightmare finding the right office for this but it’s upstairs in the building just to the right of the main entrance to the customs compound. It’s all in Thai and you won’t understand a thing but just take a number and wait and once you’ve spoken to someone they will point you in the right direction! They will update your paper work and match the car’s export date to the one on your visa. – Do not lose this piece of paper as you will need it when you exit Thailand. – We went through a couple of police stops in the south and north of the county but they just want to see the import license. No cash required! Some stops in the north are for drug searches. – Driving in Bangkok is a nightmare, even having sat nav doesn’t help as the buildings block the signal and the traffic is so bad that 3 miles can take an hour to travel. No joke. – A few of the motorways around Bangkok are toll roads. – The President Park in Bangkok is a great hotel. You get kitchen facilities in your apartment and they have parking for large overland trucks. Also the Refill Now hostel has good parking but is expensive for what you get, as you have to eat out and the private rooms, although very smart are barely wider than a double bed! – General road conditions are good but the trucks drive in the outside lane even if they’re not over taking. 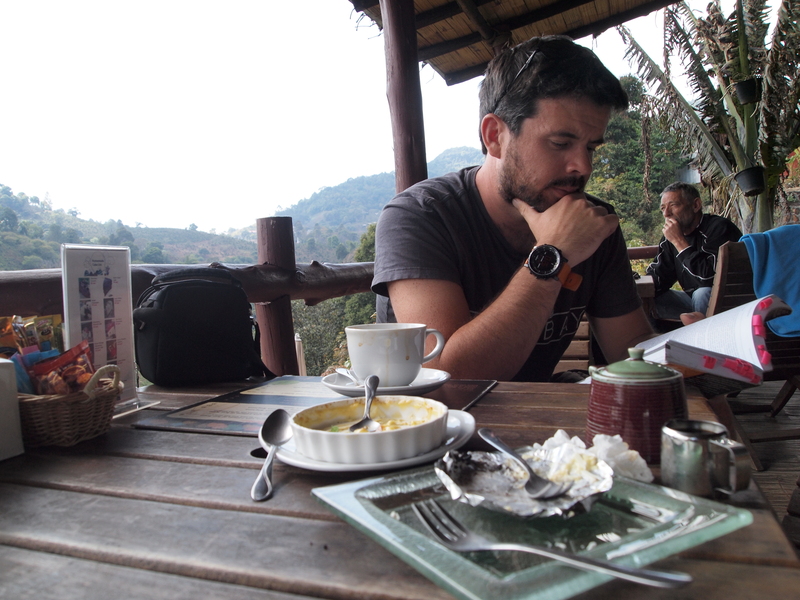 – There are plenty of petrol stations and most have a Café Amazon with free WiFi. We can also recommend their blueberry and strawberry smoothies! – Speed limits? What speed limits?? – There aren’t many campsites aside from a couple in the national parks. You can stay overnight at the service stations but accommodation is so cheap there really is no point in camping. – No Land Rover parts or garages. – Tim at Expat motors (tim_expatmotors@yahoo.com) in Bangkok is a great guy and can help with all you shipping and car needs. – You can cross the boarder into Laos at Chiang Khong (near Chiang Rai in the north) via the ferry. The customs house is at the ferry dock so take your import license there to get your car stamped out of the country. There is also an immigration booth as well. Get to the ferry early as we heard of travelers getting there late and having to pay vast amounts of cash, as the ferry service stops in the afternoon. The ferry cost us £25. – You can get insurance on the Thai side at the ferry dock for Laos, and it’s pretty cheap. – Carnet is required. The customs house, once off the ferry is up the hill on the right. We had to pay a small fee to get the Carnet stamped, but we’ve heard that some people haven’t paid anything. – Once the Carnet is stamped drive down the road to the immigration building (there will be loads of backpackers here waiting to get the slow boat down the Meekong!) and join the queue. You will need to fill out the necessary forms, provide a passport photo and pay for the visa. It can take an hour or so to get the visa and it lasts a month. – The roads are horrendous. However, there is lots of Chinese building going on and road works seem to be taking place so conditions should get better over the next few years. – Watch for the suicidal chickens. We hit one so we stopped but the villagers just laughed and waved us on! – No campsites, however again, accommodation is very, very cheap so it’s not really an issue. – Not too many petrol stations and diesel isn’t that cheap compared to Malaysia but the quality seemed ok.
– Most roads have tolls but these aren’t expensive, just a couple of pence mainly. – The LJB Smooth Hotel in Luang Prabang is awesome and it’s worth staying here if you feel the need for a bit of reasonably priced luxury. – No Land Rovers parts or garages. – No GPS mapping, but the Rough Guide do a great paper map. – The route back to Thailand is over the Friendship Bridge, just past Vientiane. Getting our Carnet stamped here took a while as we had to find the right office but they were very helpful and didn’t ask for any money. – No police stops or police interest, except in Luang Prabang where parking can be an issue and you will have to move your car from one side of the street to the other every 24 hours! – The roads are bad. Hi, my name is Pedro Santos and I’m doing an few articles for a Portuguese 4×4 magazine. I’ve been reading your blog and loving every picture and every word. I’d like your permission to do a feature on your trip. I can use the information and the photos from your blog if you allow me, so you don’t have to bother with questions or anything. Thank you and hope you have a great trip. I wanted to ask, you said, you would pick a campervan for next travels but then again you describe that the roads are bad everywhere. Would you have to change route alot to make it suitable for campervan? The reason, I am asking, is, I have a campervan but I was thinking going to get a Defender and travelling off-road/on-road Australia with the next 12 months. Your blog is a very good example and I would do something similar. What do you think swapping from campervan to Defender to go most likely same type of roads in Oz? Hey there, my partner and I are in the process of converting a 1993 landrover defender into a liveable, workable space with a bed etc- long term plan is to drive from the uk to Australia (I am from New Zealand) just enquiring what crossing and shipping company you used to get into Australia and overall how long your trip took? Our trip just over a year but that is including the 3 months we took driving around Oz. We shipped into Fremantle from Bangkok using expat motors ‘tim_expatmotors@yahoo.com’. You will need a shipping agent in Oz swell, we used Stewart Garmey at trade lines (www.tradelanes.com.au). Hope this all helps, good luck, let me know if need any other info.